Photo Provided Skillset editor Jason Swarr, left, poses with Isaiah Washington, center, along with assistant editor Ben Tirpak. 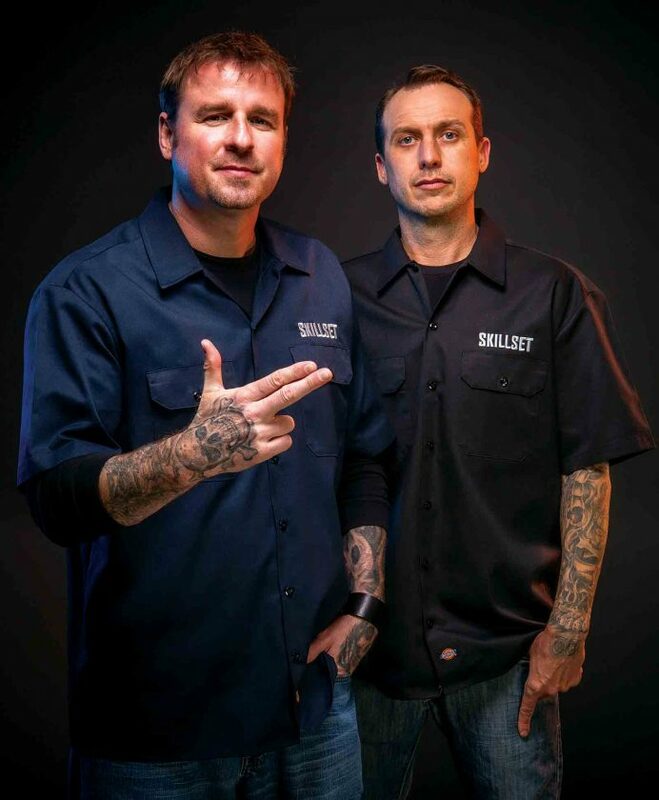 Photo Provided Swarr and Tirpak in a recent promotional photo that appeared in Las Vegas. 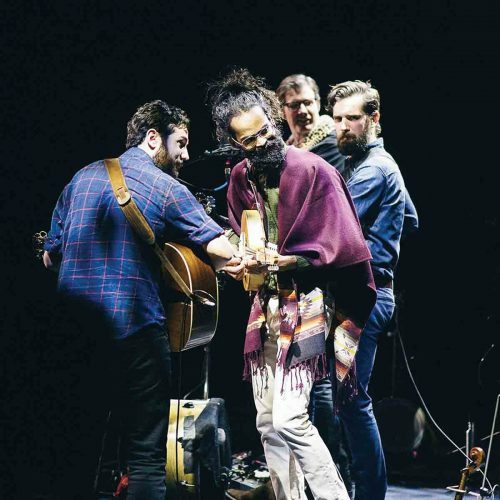 The hand signal is the “live” version of the magazine’s logo. Photo Provided Tirpak, left, and Swarr, right, pose with actor/comedian Rob Riggle. 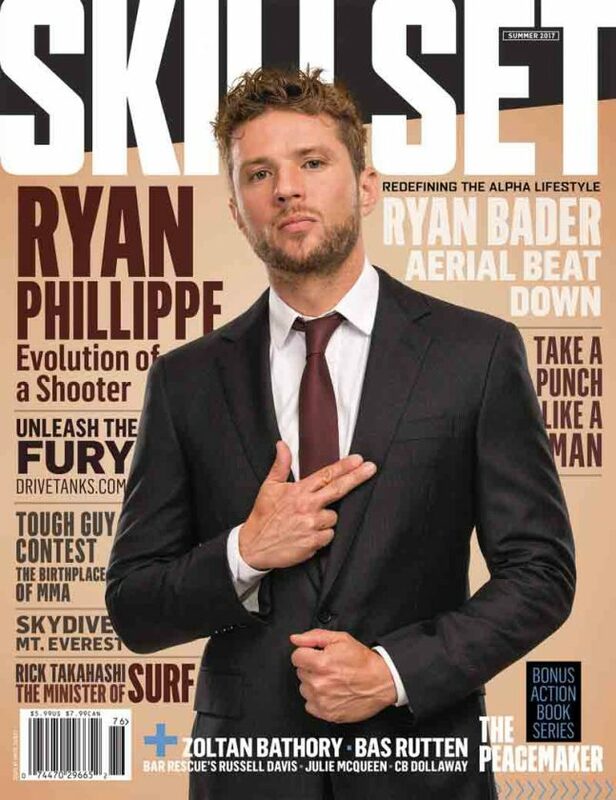 Photo Provided Actor Ryan Phillippe on the cover of Skillset magazine in the summer of 2017. 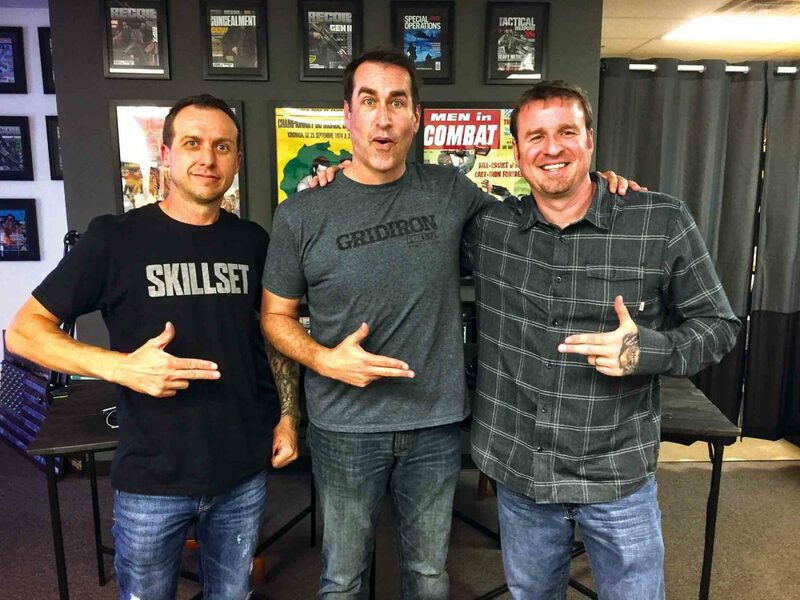 Photo Provided Jason Swarr during a Skillset podcast. PHOENIX — Jason Swarr has found his niche in the publishing world. Swarr, a Parkersburg native, is editor of Skillset, a quarterly magazine he founded two years ago in Arizona. Skillset, described as “redefining the alpha lifestyle,” was purchased by Athlon Outdoors in January. What he did have were 20 years in the U.S. Marine Corps and the discipline and tenacity to make a business work. 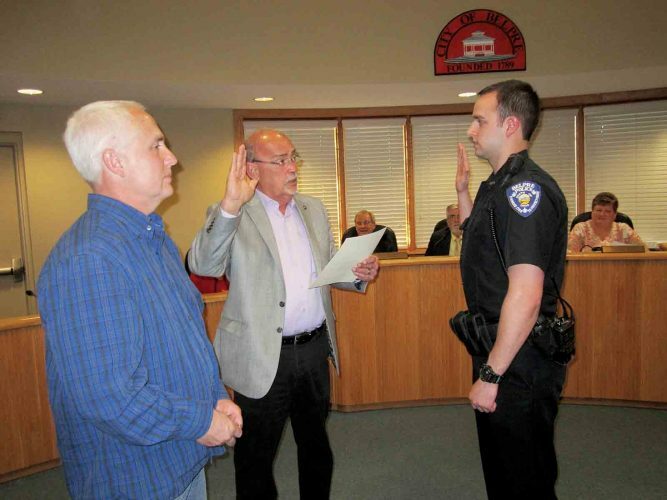 After retiring from the Marine Corps in 2011, Swarr said he was looking for something to do. Swarr became so proficient in composite photography (a photograph made by combining several photographs) that firearms industry magazine publishers used his work on 150 magazine covers in a three-year span. This success convinced Swarr to try publishing his own magazine. But it would not be a gun magazine. There was too much of a “firestorm” at the time involving the Second Amendment to the U.S. Constitution over the right to keep and bear arms, Swarr said. Instead, Swarr founded Skillset, a “blue collar men’s magazine for the average Joe,” something that was missing in publishing circles, he said. Swarr wanted his magazine to be fun and entertaining with short articles and a visual emphasis. It took him six months to prepare for publication. The first edition of Skillset rolled off the presses in January 2017 with 25,000 copies. The magazine was available at Barnes & Noble and some grocery stores. The magazine proved to be popular. Swarr said Skillset gives full support to America and the U.S. Constitution, but is not political. “We are patriotic and historic,” he said. “The alpha lifestyle is all about getting out and taking full advantage of the opportunities our great country offers. We take the path less traveled and aren’t afraid of failure. We are leaders, we are mentors and we are forever grateful for people who laid down their lives so we can live free,” Swarr said. Celebrities such as actors Michael Rooker, Ryan Phillippe and Isaiah Washington and mixed martial arts hall of famer Bas Rutten have appeared on the covers of Skillset. These celebrities like the questions the “tough guy” magazine asks them, Swarr said. Swarr believes in getting out to meet Skillset’s fans, “our readers,” at various venues, such as shooting events, off-road racing and NASCAR races. Swarr wants to provide some humor to his readers in these divisive times. Skillset puts a lot of emphasis on its podcast, which is almost as popular as the magazine, Swarr said. 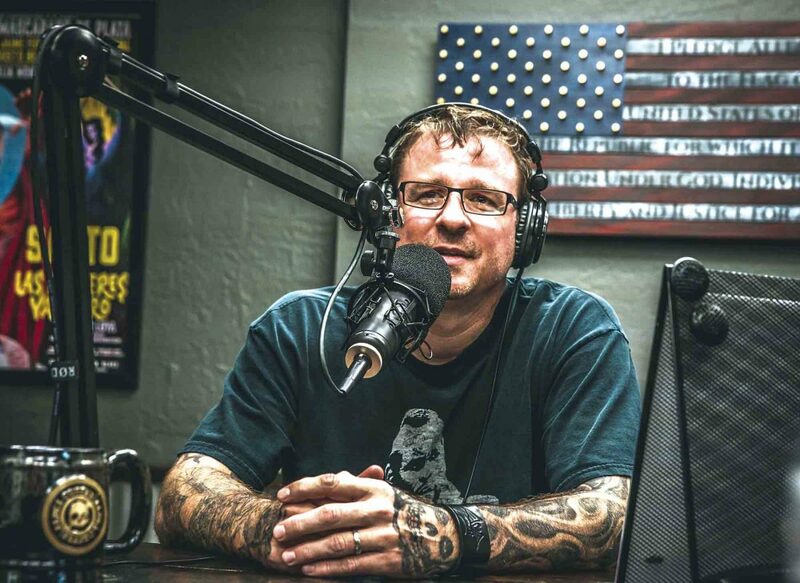 On the weekly radio show, Swarr and assistant editor Ben Tirpak interview celebrities, athletes, industry leaders, military and law enforcement heroes. He estimates that about 25 percent of the magazine’s readers are women. Skillset carries articles for women. Most of Skillset’s readers are 20 to 60 years old, Swarr said. Stories have included “The Harlem Hellfighters,” “I Was On An Al-Qaeda Assassination List” and the “Walking Dead” of the Vietnam War. Swarr writes two to three articles for each issue. His brother Chris, who lives in Parkersburg, is the magazine’s copy editor. “I love telling stories,” Swarr said, something he learned from being a Marine. He wrote about firing the gun of a Sherman tank at a tank farm/museum in Texas. Swarr will soon visit a stuntman school in Los Angeles for a story. He has provided a behind-the-scenes look at professional wrestling. Swarr does all the principal photography for the magazine covers. Swarr said he learned mental toughness while growing up in Parkersburg. “It saved me,” added Swarr, who fought in the Somalia and Iraq fronts as a Marine. He was a wrestler at PHS. The magazine’s circulation has grown to 140,000 copies. With the new ownership, Swarr expects Skillset to publish six times a year beginning in 2020. A new website is planned for this summer at skillsetmag.com. “It’s been a fun ride,” Swarr said.